Official participant badges are here. StoryADay video tutorials – how to navigate the community areas of the site, and get the most out of the community. StoryADay Courses and Books – all the StoryADay courses, workbooks and ebooks, including Breaking Writers’ Block and The Time To Write Workshop. What StoryADay May Can Do For You – Video – A video interview with StoryADay’s Julie Duffy by DIYMFA.com. Follow the StoryADay Best of the Web for Short Story Writers series for a monthly round up of the best writing/productivity/creativity posts I find online. The Writing Excuses Podcast is fifteen minutes long and features three working writers and/or artists and their guests riffing on writing. It’s really valuable even if you are not, like the guys in the podcast, writing in SF/Fantasy/Horror/comics. They talk about craft, the day to day job, and the business. And it’s fun. Writer and Editor Tom Bentley shares excellent advice on living and working as a writer (4/20/10). Escape Pod A sci-fi short story podcast. If you need inspiration, why not listen to some great short stories? Hack Your Way Though Writer’s Block Great advice for days when you get stuck. Inky Girl A writer’s weblog, from former Inkspot Editor, Debbie Ohi, mostly focusing on kid’s lit — plus great original comics. Name Your Characters Name your babies with the most popular current baby names. One Writer’s Post-Morten on his efforts to write a story a day for a YEAR (and you thought we were being ambitious?!). Really useful analysis of what he gained from it! Why Self-Conscious Writers Are Doomed – and some advice about how NOT to be either one. 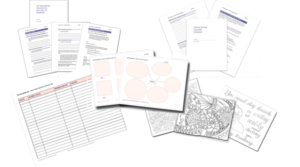 Tons of worksheets to help you brainstorm ideas, flesh our characters, break out story beats, from Jill Williamson (10/20/2015). Write Or Die! Set your time limit and write quickly, or Dr. Evil’s gizmo will begin to erase your words! Rory’s Story Cubes – now available for iOS. Also available as incredibly pleasing physical dice. I Stole This From You – short stories and illustrations about meaningful, stolen objects. Flickr’s Explore Feature – Every day photo site Flickr puts up beautiful photos. Browse, get inspired, write. Obituaries – Potted life-stories for you to mine. Wikipedia’s Front Page – Featured article, On This Day, In The News, Did You Know…? I challenge you NOT to find a story idea here! Jon Scalzi’s The Big Idea One writer asking other writers about the Big Idea behind their stories. Always fascinating. Story Structure To Die For – an introductory article and the offer of a whole free ebook on the topic by novelist and screenwriter P.J. Reece. On Writing About Loss – and other ‘exhausted’ topics, by short story writer Robin Black. Some great ideas here. Leverage Writers’ Blog – The TV show Leverage (which I’ve never seen) has some wonderfully opinionated writers who share their thoughts here. This page has articles about screenwriting, but they focus on story, story, story (not the ins and outs of typsetting or the TV business, although there is some of that, which you can skip if you don’t care.) WARNING The language is not always G-Rated. 15-20 minutes about writing, creativity, inspiration, prompts and more, based on the monthly StoryADay Themes. Every two weeks throughout the year. This podcast features published authors on tour to promote their latest release. Sometimes the podcast features archived events, but usually they are recent. Each author usually reads a little from their work then takes questions from the audience. The library has a good system, where they take microphones into the audience so you can hear the questions as well as the answers. The audio quality is good and the questions are asked by everyday folks like you and me. I love this podcast. This podcasts hosts many of the same authors as the Philadelphia podcast, but the authors often read different passages and answer different questions. Also, it hosts more ‘smaller’ authors who have a local connection. It’s nice to get a non-East-coast, non-establishment perspective. Also, AOT sometimes takes its recorder on the road and reports from places like Book Expo America. A monthly podcast from the University Bookstore in Seattle. For the past four years Nancy Pearl has talked to big name authors on tour. This interview-style works well, perhaps because it’s in a bookstore and the authors are comfortable; perhaps because Nancy Pearl is an intelligent interviewer. The audio quality is great and the half-hour length is long enough to go in-depth with the authors but not so long that it drags. This is available as audio-only or video too. Running since Oct 2010, still being updated. Interviews with authors. Fewer big names than the other podcasts, which means you hear some new voices. From the University of California at Irvine. Discussions on art and writing, featuring interviews with writers, and occasionally editors and agents. Recent guests have included Edwidge Dandicat and Betsy Lerner. Interviews with authors. Interviewer talks a bit too much, but really loves books, so we’ll forgive him. This one isn’t about writers or specifically for writers, but it’s inspiring anyway. Little potted stories of people’s lives. This podcast features excerpts from classes taught at the Odyssey writing workshop held each summer. 16 writers are picked each year for this professional-level workshop, and it features published authors as teachers and lecturers. Each podcast is 15-20 minutes long and packed with useful information for more than just Science Fiction or Fantasy writers. These talks are aimed specifically at writers, not readers, and you should come away inspired to get back to your own writing after listening. Sometimes the talks touch on the publishing business, but more often the topic is craft-related. Brandon Sanderson, Howard Tayler, Dan Wells are writers and artists in the science fiction world. Their podcast’s tagline is was enough to turn me into a fan: “15 Minutes Long, because you’re in a hurry and we’re not that smart”. They discuss the craft of writing from their perspective as working writers. The free-form conversation follows a different topic in every episode. As always, just because these guys are sci-fi and fantasy writers, this does not make their advice applicable only to SF writers! My top ‘must-listen’ podcast. All the stuff inside a MFA, none of the crippling student debt. You should subscribe! Litopia hosts four different podcasts: Litopia After Dark, The Debriefer, Between The Lines and Open House. Litopia After Dark is a “A literary salon” with five hosts, each of whom brings a topic and gets a different discussion going, and a chatroom where people can send in comments during the broadcast. It is extremely well produced and it is fun. Good for reminding lonely authors in our garrets that we’re not alone! Between the Lines is an interview-with-the-author podcast and Open House is a call-in show (“Skype-in”, actually). My favourite, though is The Debriefer podcast hosted by Florida lawyer Donna Ballman. She covers legal issues as related to writing: using legal issues in stories, legal issues that affect writers. It’s a short, focussed podcast and I find it quite fascinating. This one violates my policy of not reviewing podcasts that are no longer being updated. There are only six episodes of this podcast, from 2006 but they are so tightly focused on the craft of writing, that I wanted to include them anyway. She seems to have moved on to creating products like workshops and classes that she charges for (and I don’t blame her one bit), so grab the free podcast info and graduate to paid classes if you like her stuff. This podcast is aimed specifically at non-fiction, science fiction, screenwriting and comic book writers. It’s relatively new but promising. 3 AM Magazine – With the tagline “Whatever it is, we’re against it”, how could I resist this publication? Its rebellious spirit is the perfect inspiration for short fiction writers. Flash Fiction Online – another great source to find short fiction that packs a punch. Flash Fiction Chronicles – more short fiction, available online. Nano Fiction – super short stories. Take a look and see just what you could achieve in very few words! Project Gutenberg – The Granddaddy of them all. All books here are public domain (and therefore a little elderly, no I mean they’re classics) but you can rest assured you’re not abusing anyone’s copyright. Books are available in a variety of formats from Text files to ePub and Kindle formats. Smokelong Quarterly – A venerable repository of flash fiction online. All stories can be read in a smoke-break—that’s how long this website’s been running. You used to be able to smoke in public! Vestal Review – Possibly the oldest online flash fiction magazine out there, and still publishing great stuff.